Chevy Volt owners looking to know the cost of charging their car will soon be able to do just that, thanks to a new OnStar app. Called EcoHub, the app is currently being tested on a limited basis with Volt owners residing in the Pecan Street demonstration project, a smart grid living community in Austin, Texas. 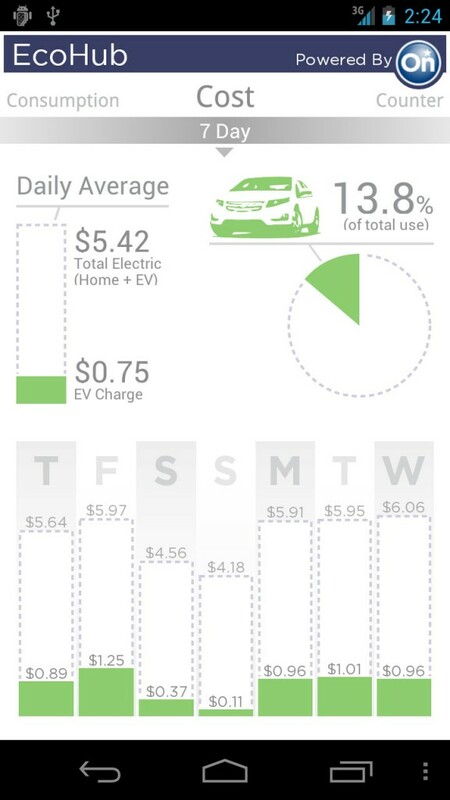 The app provides Volt owners the ability to view energy cost and consumption data, showing how much it costs to charge the Volt as well as to power the rest of their home — removing the anticipation of the arrival of the (monthly) utility bill. 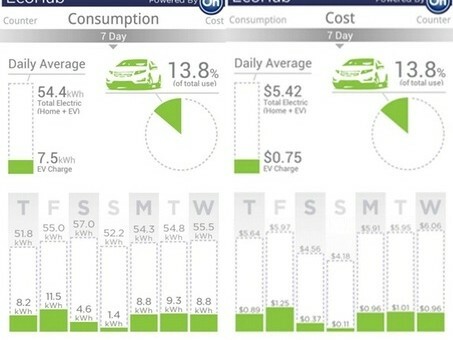 EcoHub works by pulling overall home energy data (provided by an energy data source, such as a utility or smart meter company) and combining it with vehicle charging information from OnStar. 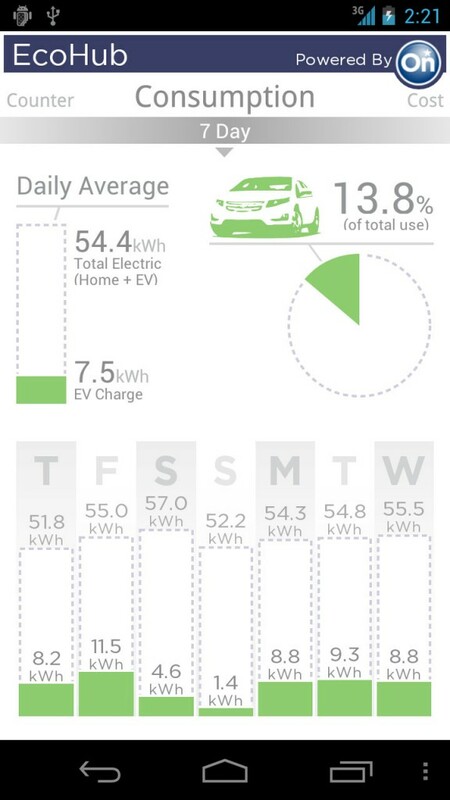 The data is then aggregated to show how much energy is used on a daily, monthly, or yearly basis, while conveying how much of the total energy use was used to charge the Volt. 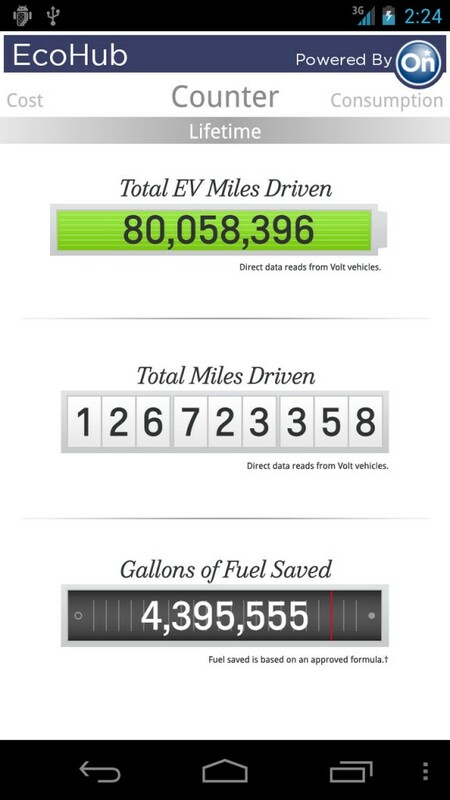 In addition, the EcoHub app includes a “Ticker” that shows Volt drivers the national values for Total Miles Driven, Total EV Miles Driven, and Gallons of Fuel Saved — allowing Volt owners who already love to keep track of and compare driving statistics to do so from their smartphones while being part of a national/global movement in reducing fuel consumption. Even though EcoHub is being tested with Volt drivers in Pecan Street project at first, OnStar hopes to make it available for all Volt owners in the near future. The app is part of the Smart Grid research initiative made possible by the U.S. Department of Energy and carries the potential ability — provided necessarily partnerships are made — to check stats of other devices in the home. EcoHub joins Ontar’s existing RemoteLink app that allows owners of most late-model GM vehicles to perform remote commands (such as remote start, horn/lights, door lock/unlock), check the status of the car (fuel range, oil life status, odometer readings, etc. ), and send directions to their car. Besides the fact that it’s really, really cool, the EcoHub app has the potential to take the guesswork (along with the Fear, Uncertainty, and Doubt, or FUD) out of charging electric vehicles such as the Volt. And that should decrease the unfamiliar barrier to entry preventing more Volts sales. Next story Is GM’s ‘Shop-Click-Drive’ A New Online Sales Initiative? James, your comments prior to this one have portrayed you in a rather progressive light, but this doesn’t make any sense man. Big brother? Seriously? If Big Brother wanted to screw you, he already would have. This is a matter of simple convenience, not privacy. Hi, S.E., thanks for the dubious response, but I usually vote conservative yet try to stay open to consider myself politically independent. Were I to slap a label upon myself politically, it would mean I endorsed all the Republicans do, which I surely do not – such as – demonizing the Chevy Volt , and GM for that matter, or being the mouthpiece of the oil and gas industry. I’m hard to pin down, in other words, yet people often try. I endorse electric cars because I like to breathe clean air and dislike noise pollution. I love my country and really am ashamed that after all these years we’re still hogtied by foreign lands and their oil hand over us. I believe “Progressives” who hide behind that label truly do a misdeed to the word. I have read, and still am reading both sides of the Smart Grid/Smart Meter debate. I’m not sure how “smart” all this is for the common man. Like global warming, it’s a complex issue where both sides have notable points. No conspiracy theorist, I don’t use the term “Big Brother” quite as you may think. Today, where I stand may change, but as an American used to many freedoms, I also may come off as somewhat of a libertarian if, again, you are into labels. For instance, today I added the app, Lookout to our cellphones and will look into LoJack for phones for added security ( CNet.com has some great articles on smartphone theft-security if you’re interested – a fascinating look ). When I did so, I realized I was giving up a whole lot of personal data to people whom I do not know. It’s one of those dilemmas us modern people have to deal with – like storing things on the cloud, etc. So as we speak – my area hasn’t embraced Smart Metering which many EV, PHEV advocates just adore. Many EV and PHEV owners prefer other simpler ways of monitoring their electric usage such as a seperate meter attached to the EV garage circuit, or just simple bill monitoring or using devices to measure load…etc. I don’t really see this as a convenience – as much as another way others can monitor everything you do inside the privacy of one’s own home. I think a SmartGrid system puts the community more at risk of rationing or punishment-or rate increases if others assess your power usage as excessive. And no, I’m not growing pot in my basement! LOL! All-in-all, call me whatever you wish, but my main goal is to make my own power via solar, wind, geo-thermal or perhaps a Bloombox fuel cell system…This way each individual or property owner can manage his/her own needs and not rely on a vast complex system to tax; bill; assess your personal power needs and allowances. So far on this subject – how do you feel SE? I must say this issue is one where many Democrats and Republicans agree with each other! And that, of course, is very refreshing, for once! After all – when one argues that an electric vehicle is powered by coal – even though folks like me get their electricity mainly from clean hydropower…It’s nice to know we are reaching the age when we can power our lives in every way with energy from the Sun, the wind or the thermal properties under the earth. Americans are all about independence – we all can rally around this. When the sun or wind powers our car, our lawnmower, our TV, microwave and cellphone – how great is that?!! In fact – I cannot fathom why so many ( most of one political party ) are so bent against this happening but for those who finance their political campaigns. Humans are whack – me included, of course. But it goes beyond reason that people in some neighborhoods prefer aesthetics – as to fight against neighbors having a wind turbine ( yes there are quiet ones ) or solar panels – they would rather we all stay pinned down to paying some power authority to run powerplants and large utility administrations to provide what we indeed can provide for ourselves. Now tell me this all makes sense. Many of us cannot go out on our veranda without seeing the neighbor with the big hairy bare chest and beer gut barbecueing on his deck, yet it’s a sin to have an “ugly” solar panel on one’s roof! LOL? HUH?!!! We must listen to the dear neighbors’ howling cat, partying teenagers or barking dog, but the sound of a wind turbine ( yes, quiet ones exist – see Honeywell wind turbine ) is enough to prevent many of us from enjoying our own energy independence.